Go call your mom, your dad, your brothers and sisters if you have any, and tell them you love them. Incendies is a French-Canadian (woo!) film by superstar Quebecois director Denis Villeneuve. I’ve written in the past about some of his films, pretty much all of which I’ve loved. Well, tally one more up for Mr. Villeneuve, because Incendies might just be a new favorite of mine from him. It kicks off with Jeanne (Mélissa Désormeaux-Poulin) and Simon Marwan (Maxime Gaudette), Canadian twins of Middle Eastern descent who are meeting at their mother’s notary’s office after she has passed away. Included in their mother Nawal’s (Lubna Azabal) will, are two envelopes, one for their father and one for their brother. The friction starts immediately as the Marwans never knew their presumably dead father and have never had another sibling. Jeanne travels to their mother’s birthplace, an unspecified country in the Middle East to trace the steps of her mother’s life so she can solve the mystery of her missing father and brother. Simon, reluctant at first, eventually joins her with Lebel, the aforementioned notary. While in the Middle East learning about their strange family history from locals who seem to resent them on sight, they slowly begin learning a dark secret about their family that they couldn’t even have imagined. Watching Incendies is an exercise in emotional fortitude. A majority of the movie is spent in the Middle East, shifting between Jeanne and Simon’s modern day detective-work and flashbacks to Nawal’s daily fight for survival across multiple war torn decades. Death abounds, especially in Nawal’s story which is shown to us even though most of its information does not reach her children. It’s an interesting scenario when we’re given the context and details of Nawal’s actions when the twins are receiving just the impressions left from hazy memories or second hand information from the people they are interviewing. Some consider her a monster, some a victim, some a legend. Every once in a while, they’ll stumble upon someone who knew Nawal personally, and learn firsthand about a portion of her old life from before she escaped to Canada. We’re bombarded with unpleasantness as we follow Nawal, seeing how brutal and unforgiving her home country was when she was young. Christians are killing Muslims and vice versa purely on faith alone. Nawal was born Christian, fell in love with a Muslim, and got pregnant. She had a target painted on her back from birth, and she only helped draw in the bulls eye. Driven to survive no matter what, to claw her way to a better life and start again, Nawal agrees to do and is sometimes subjected to unthinkable acts of violence and depravity. The scene referenced in the poster above is still ringing out in my brain, and I feel like sinking further into the couch I’m sitting on by just thinking about it. However, regardless of the horrors Nawal witnesses, she soldiers on. As the Marwans begin catching up to their mother’s past life and film reaches its heart-rending conclusion (don’t worry, I won’t spoil anything), we as an audience are stuck like deer in the headlights. Villeneuve has spent the last two hours slowly priming us, feeding us just the right amount of information, painting our perceptions just so that when things finally come to a head you’re left with what feels like a confusing, terrifying mess in your brain. This is intentional, as Jeanne and Simon are left in the same boat. The denouement, while quick, ties everything together and cleans up any mess that you thought was there but still leaves you confused and terrified. Tears were had by my partner and I as we sat in silence for a few minutes while the credits ran. 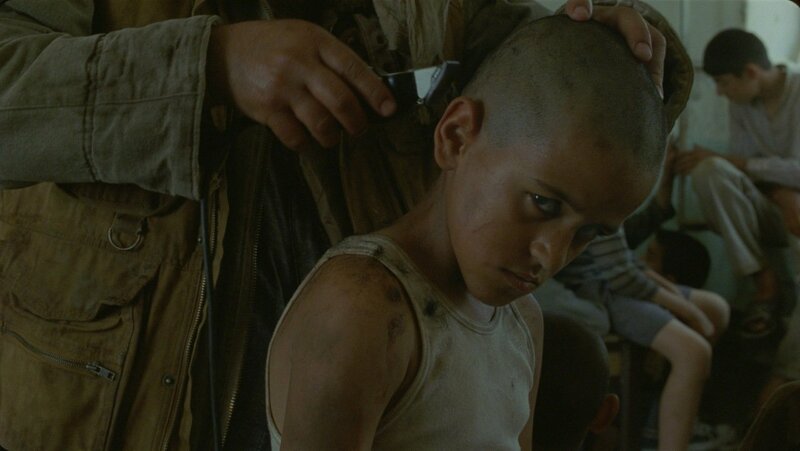 Do yourself a favor and watch Incendies. Pick up a copy any way you can and force yourself not to look into it before watching it. I understand that this sounds like the film has a “twist ending wooooaaaahhhh”, but even though the saying goes “it’s about the journey, not the destination”, Incendies is about both. Following Jeanne, Simon, and Nawal through a devastated country across different decades simultaneously is an engaging, edge-of-your-seat journey and the path that Incendies walks leads to one Hell of an ending. The two are married together in this film, and one wouldn’t be half as powerful or stirring without the other there to support it.